A brand that I have always heard amazing things about, but never really bought anything from is Josie Maran. Known for the handful of argan oil products, this clean beauty brand has been a classic at Sephora for years. I have picked up a couple of products over time but was never fully into the oil products phase yet. I was given the chance to pick out a few products from the brand to give a test, and I decided to get three makeup products to cover from base to lips. Let’s dive in! To prime the face, I first picked the Argan Moonstone Drops Makeup Priming and Highlighting Oil. Long name, but it’s allowed to because of its multitasking properties. This oil acts as a base primer, along with a highlighting oil to give a radiant glow to the face. It combines the brand’s classic 100% Pure Argan Oil Light with pore-smoothing priming pearls. This oil helps to boost your skin’s elasticity and gives off that radiance that (most of us) want! It works amazingly for providing hydration to dry skin, smoothness to uneven texture, and brightening effects to dull skins. The argan oil properties help nourish the skin with the priming ingredients work to prep your skin for your makeup application. It can be used in different ways: using before foundation, mixing in with your foundation, used on your cheekbones, or even on your lips. This oil blends in the benefits of aromatherapy and essential oils as the lemongrass lavender oils help to calm any inflammation and redness in your skin. Once your skin is all prepped and ready, the foundation is next. 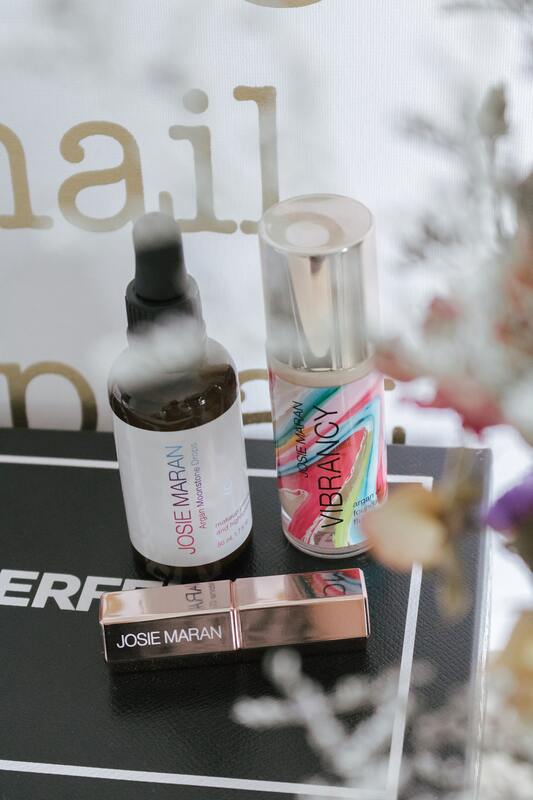 The Vibrancy Argan Oil Foundation Fluid from Josie Maran has always been on my list to try. I have seen it being praised by the likes of beauty gurus like Jaclyn Hill. 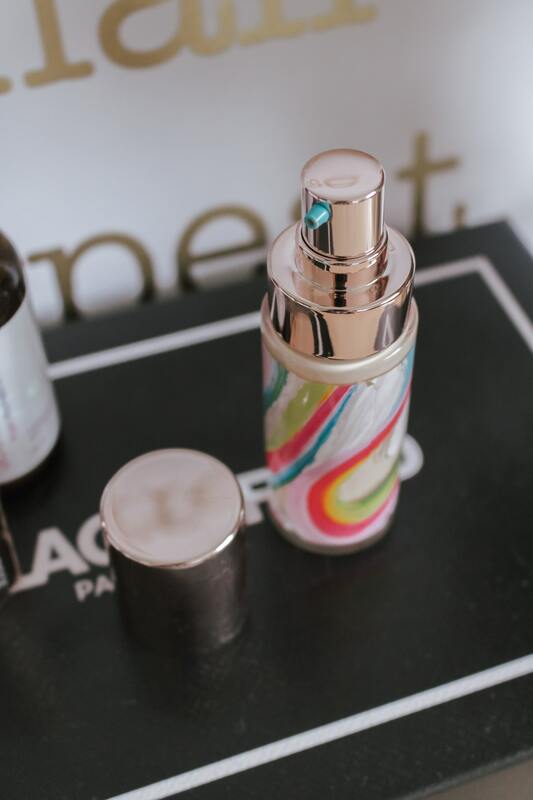 Taken from the official description, this foundation “utilizes a revolutionary cold-pressed process that preserves the powerful, hand-selected ingredients for the freshest, most effective skin care foundation”. 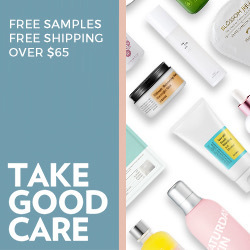 I really appreciate when brands blend the benefits of skincare into their makeup products, and that really gets a product higher on my list to try. This foundation adapts to your skin’s movement to stay “fluid” and not just be a layer of makeup on your face. The formula is lightweight and easy to blend out. I have used both a sponge and brush for application. For a sheerer light to medium coverage, the sponge was best. For building up the coverage, a brush could be preferable. It is not a matte finish is it helps lock in the moisture and give a radiant glow. The Josie Maran Argan Lip Sting Plumping Butter is a combination of so much goodness. Let’s break it all down. From the outside first: the packaging! One of my all-time favourite lip product packaging designs. The geometric honeycomb shape of the tube helps it not roll away on a counter. Its golden colour is gorgeous, period. The little bee illustration on the top helps remind you of the honey ingredients and the lip plumping abilities. As with all the products, it contains 100% pure argan oil. It is a very conditioning tinted lip balm, but with a tint of colour that actually provides a fair bit of pigment. Argan oil, manuka honey, moringa butter, and konjac root work together for the best of all worlds. Sealing in the moisture of your soft lips, providing nutrients to heal your lips, and fill lines and plump all at the same time. The plant extract blend “Volulip” is what also helps plump the lips, providing the slight stinging feeling for fuller looking lips. I can tell you it works too! 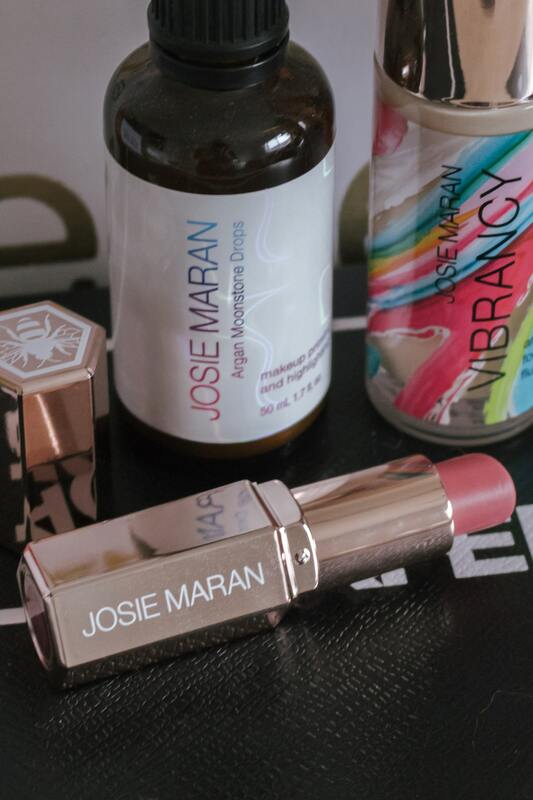 Have you tried anything from Josie Maran before? Let me know in the comments below. I’m always open to your best recommendations!